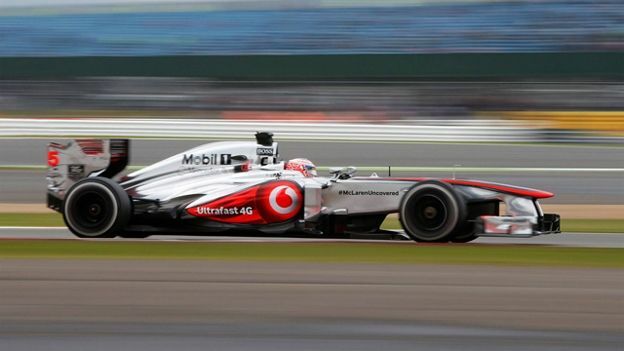 Vodafone was reportedly asked by EE to remove an 'Ultrafast 4G' sticker from F1 drivers Segio Perez and Jenson Button's cars and to have them garaged. EE however denied requesting the cars to be removed from the track but did admit ordering the advertising to be removed as Vodafone's 4G service is yet to be launched. Furthermore to really infuriate EE, Vodafone have just released their new 4G-ready mobile device, the Vodafone R212. Vodafone boast their new portable hotspot to be the 'fastest, most capable and most reliable around'- however eager customers must persevere for the meantime and surf the somewhat disheartening current 3G network whilst they wait. This will be the latest 4G-ready device on the market to join the likes of the Samsung Galaxy S4, the Nokia Lumia 925 and the BlackBerry Z10. When the 4G network is eventually up and running Vodafone say the new R212 will be capable of boosting your internet connection to an impressive 100Mbps. This will ultimately allow streaming, browsing, online gaming and pretty much anything else that requires an internet connection to be just that bit faster. The device is also equipped with a long-lasting 2800mAh battery and a built in SD card reader up to 32GB. As of yet EE is the only 4G network around but this clearly hasn't stopped other networks prepping themselves. With EE customers recently complaining about 4G's high prices, Vodafone and other networks will certainly heat up the competition.